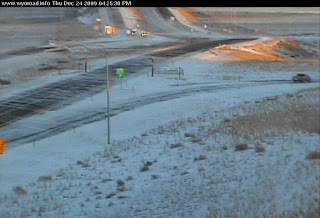 This is a Wyoming Department of Transportation CAM photo taken 12/24 west of my home, just barely into Wyoming - our weather here is about the same, but without the highways. Note - not much traffic. Look closely and you can see the gates which are closed when things get really BAD. I DID like the way the light shone in the background. Pretty! NO WAY am I going outside to take photos! These weather CAMs give us a great picture of serious conditions much better and more up-to-date report than the Weather Channel. It's about 5 degrees above zero, wind is blowing at 35-56 mph, but fortunately, we are not getting a LOT of snow with it. It's blowing to Eastern Nebraska or maybe Iowa. We are grateful for a wood supply, a warm home, plenty of food, and don't have to go anywhere! And tomorrow is MY day for quilting. It looks VERY cold! I'd stay inside too. Looks familiar, only we have a lot more snow here in NE Nebr. Winds are about the same. From hearing the forcast I think I'll have a snow day tomorrow. The storm is supposed to pretty much blow itself out be Sat. night but as long as the wind keeps blowing the streets won't get plowed. We postponed our family Christmas to Sunday, now I'm wondering what the roads will be then. Sounds like being snowed in could be fun. Hope this didn't ruin any family gathering plans. The snow is finally melting here. That light is pretty, but otherwise a forbidding sight lol. Nice to be warm and safe at home. We have the same here but lots and lots of snow. We were snowed in on Christmas day and it's still blowing this morning. I hope we can get out tomorrow. Elaine! So fantastic you could share this with us. I know how to read this. Visually I mean. I grew up in the mountains so I know this is SERIOUSLY UNSAFE. As well I know what a pleasure it is to have nice dry wood to burn and plenty of food. ...and a day to SEW! When I grew up in this weather I was so bored. ...and only 3 channels on the TV. You know what I did? I copied some of my Dad's Albums to Tape. He was cool about letting me play "D.J." to the house. Now that I think about it. That was fun. I guess I was creative in some way. When I was at my Mom's I probably read a book. Different houses, different aspects of Karen. Interesting how you brought this forth. Always bringing me to a new thought. I dig Blogging with YOU! So glad we missed this one. But our time will come. I have always thought the Weather Channel ignored Wyo, Ne and Colo. The DOT cams are the best way to tell. There is a stretch of I-25 that always gets closed between where I live and Cheyenne. It isn't supposed to warm up this week either. Stay warm. Happy New Year! Well eastern NE has all the snow, about 10-12 inches of it. It snowed for 24 hours or more. I-80 was closed between Grand Island and Omaha yesterday, I've never heard that before, I lived here in eastern NE for 30 years! City crews will have lots of overtime plowing out. At least we are in our own home, have food, water and power! Sounds like a sewing day! we got the snow. and the wind. and we are STILL having some blowing snow as I write this (5:30AM Sunday morning). I have been checking the DOT cams too, we are supposed to go to MN today, but after reading the road conditions and checking the cams, I doubt we will go until Monday. sigh rats!